My husband and I will take our 9 year old nephew on a vacation to Florida. It will be his first time on an airplane. We will go to Disney World and Legoland. In celebration of our upcoming trip I made this simple Disney and Lego themed meal. Lego Bricks: Yogurt frozen in this Building Bricks Ice Cube Tray. I take it that he knows his surprise now! what an awesome trip for him. I love the carrot plane. Have a wonderful time! Thank you! Yes he is very excited. 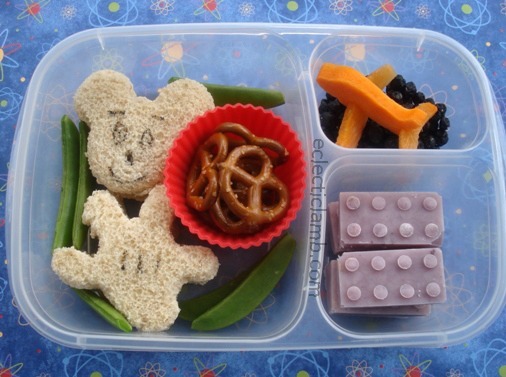 Super cute bento, I especially love the carrot airplane! Have a fun vacation Kathy!